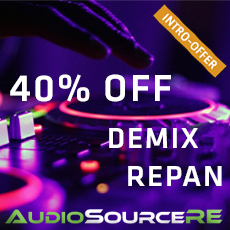 Separate and Remix Stereo Mixes on the fly, isolate Vocals, Drums, and Instruments from existing mixes with DeMix Essentials, DeMix Pro & RePan! The introductory offer is valid until the end of April! DeMIX Pro combines cutting-edge sound isolation algorithms with an advanced spectral audio editor to provide audio engineers, producers, DJs, and Musicians unrivaled freedom to create isolated vocals, drums and other instruments from existing mixes. Ideal for high-quality vocal separation, instrumental creation, and production quality sampling. DeMIX Pro delivers unmatched flexibility over other audio separators by offering unlimited, non-destructive track separations, convenient merge tracks functions, a built-in multichannel mixer and its ability to provide the separated vocal and its associated reverb on individual tracks for total vocal control. Separate and Isolate vocals, drums and other instruments using the automated and user-definable separation options. Refine your separations using our intelligent spectral editing tools to create countless high-quality individual track separations for remixing, up-mixing, re-mastering, and post-production applications. Manipulate audio mixes like never before.